As low as $6.99 per coin over spot! Among the many silver coins for sale from the Perth Mint, the Australian Silver Wedge Tail Eagle is the fastest growing in terms of popularity with collectors and investors. The Wedge Tail Eagle is native to Australia, Tasmania, and southern New Guinea and is one of the largest predatory birds in the world with a wingspan of 8.2 feet. Today, the 2019 1 oz Australian Silver Wedge Tail Eagle Coin is available to you online from JM Bullion. Available to you inside of protective packaging, tubes of 10, or boxes of 100 coins! 6th issue of the Australian Silver Wedge Tail Eagle coin! The face value of $1 (AUD) is fully backed by the government of Australia. 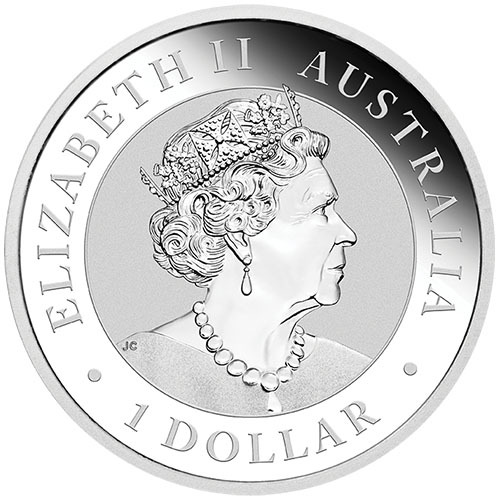 On the obverse is a new effigy of Queen Elizabeth II. The reverse bears a new design of the Wedge Tail Eagle for 2019! Reverse design from John Mercanti. This is the sixth release of the Australian Silver Wedge Tail Eagle, the third best-selling coin from the Perth Mint. The Wedge Tail Eagles sixth release features just the fourth design from John Mercanti in the series. The 2014 debut design was used again in 2015, with a new image used in 2016 and 2017. The 2018 coin featured its own, unique design. Now, the 2019 Silver Wedge Tail Eagle has a new design that will be available only for this release. 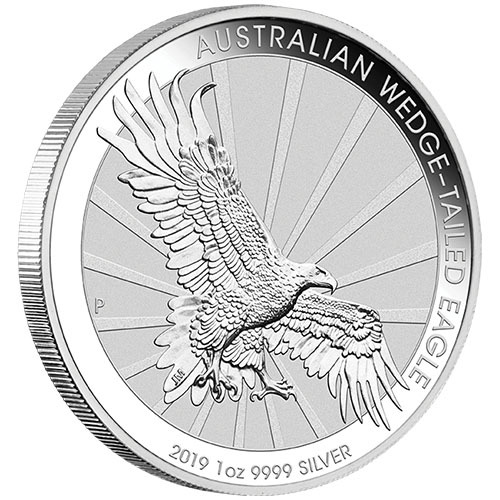 All of these 2019 1 oz Australian Silver Wedge Tail Eagle Coins are available in Brilliant Uncirculated condition and come with individual packaging, tubes of 10 coins, or boxes of 100 coins. This is the first year in the Silver Wedge Tail Eagle series that the coins have both a new reverse and obverse design. On the obverse of 2019 Australian Silver Wedge Tail Eagle Coin is the latest sixth-generation effigy of Queen Elizabeth II to feature on Australian coins. Based on Jody Clarks 2015 design for the Royal Mint of England, this portrait captures the Queen in right-profile relief wearing the Royal Diadem crown. Unlike British coins, this new design includes the Queens neck and shoulder line visible. 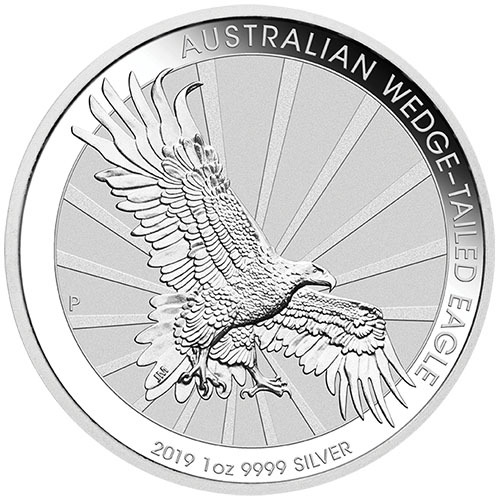 The reverse of 2019 1 oz Australian Silver Wedge Tail Eagle Coins features a new design of the Wedge Tail Eagle species. This years design captures this magnificent bird in flight with its wings spread to the maximum span of more than 8 feet as it prepares to swoop down on its prey. The design again comes from John Mercanti, the former Chief Engraver of the United States Mint whose design portfolio includes the heraldic eagle of the United States on the American Silver Eagle and the Statue of Liberty on the American Platinum Eagle. Please dont hesitate to reach out to JM Bullion if you have questions. You can call us on the phone at 800-276-6508, chat with us live online, or simply email us.